Are you a small business owner frustrated by the poor performance of your business? Are you "too busy" to get organised and take control? Have you been considering using a business coach to help, but have concerns about getting the right person and not paying too much? If so, then this comprehensive and practical guide has been written for you. SALE PRICE - AVAILABLE NOW for only AUD $14.96 (Australian Dollars) as a PDF guide. Thats 25% off the regular PDF price of $19.95. Click here to buy your PDF download from the Lulu.com bookstore. 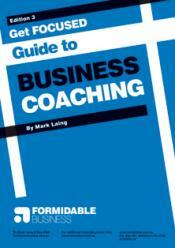 The 'Get FOCUSED Guide to Business Coaching' is a PDF Download to assist small business owners to decide whether they need a coach, the type of coaching required, and a set of questions for interviewing prospective coaches. It is written by a coach with nearly two decades experience working hands on with business owners and provides an insider's perspective on whether you need a coach and how to interview and select the right one. Engaging a coach can be an investment of many thousands of dollars, use this guide to determine the right coaching solution for your business. This comprehensive guide includes two detailed checklists for determining the type of coaching required and a set of interview questions for selecting the right coach.